According to acclaimed sleeping psychic Edgar Cayce, Atlantis was located from the Gulf of Mexico to Gibraltar and was destroyed in a catastrophic deluge around 10,000 B.C. 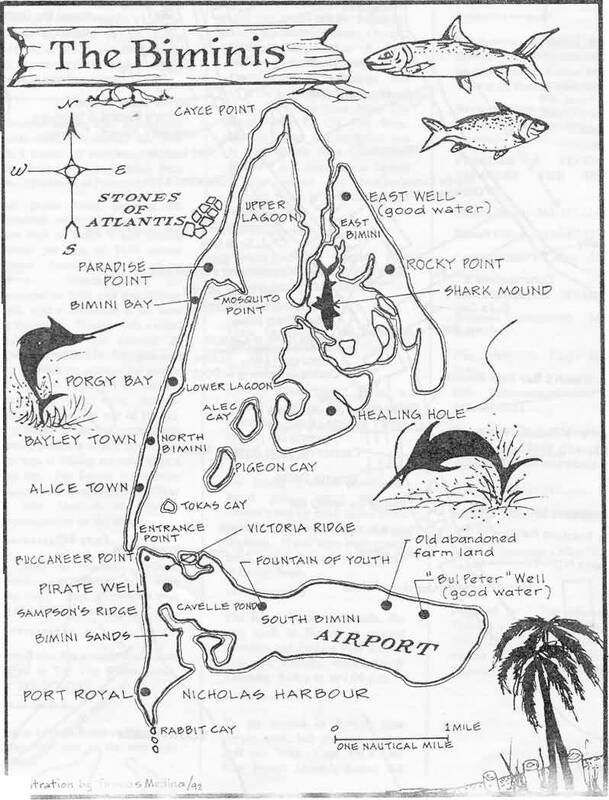 Edgar Cayce identified Bimini as one of the mountaintops of ancient Atlantis. While few would consider the island a mountain, according to Cayce 12,000-years ago it was one of the highest points on the vast land formation in the region. Along with Bimini, Andros Island lying about 100 miles to the east of Bimini was also a part of the same island in 10,000 B.C. But what makes Bimini very unique is that Cayce had visions that among the isles of Bimini were hidden curative healing waters that were revered by the Atlanteans. According to Cayce the Atlanteans built nearby temples to each of the curative waters. The Healing Hole is the only site to date that has been discovered of the many wells described by Cayce which have various healing properties. “The healing hole” as it is known by the Bimini locals was discovered by the Taino’s long ago, and at one point it was only known by Bimini locals and sailors whom knew of its whereabouts, as they kept it a secret. The healing hole a freshwater spring resembling a large well that’s only accessible by boat and is surrounded by salt water in the mangrove swamps on the deserted east side of Bimini. Once you reach the entrance to the spring by flat boat, you have to waddle chest deep through a pathway in the mangrove to reach the spring. This particular hidden curative spring has earned the name ‘Healing Hole’ because of the healing properties reported by those who have swam in it. Edgar Cayce describes the water as healing sulfur water, which is interesting because recent chemical analysis of the water reveals it contains significant amounts of lithium, sulfur, and alpha radiation. Of all the acclaimed healing mineral springs located throughout the world including the famous mineral springs in Jamaica(Milk River & Bath Fountain), the Bimini healing hole intrigues me the most. Mainly because it’s allegedly linked to Atlantis and I actually knew someone who was a ships captain who told me a couple of visits to this healing hole cured him of a bad case of psoriasis. I would love to visit this spring, though I don’t like the idea of waddling through mangroves. If you are thinking of visiting Bimini there’s a seaplane operated by Tropics World Airways and Bahamas air that serves Bimini from Miami.